The two friends move on in the gallery. "You have now shown me two examples of hyper-modern art, but I still don't quite get it. What is this 'art' all about?" "Art, my friend, should draw the observer closer, involve him, make him think or feel. Hyper-modern art aims at this with a slightly different angle. To understand an image, the observer has too fully engage with it until he discovers the things which rule the image underneath. By doing so, the image depicts exactly what can not be seen. Do you understand?" "Hmm, I see how this applies to the two previous examples, but it doesn't help me much with understanding any new piece, does it? Just look at what is hanging here: Why on earth is the picture called The (colour) star, if the star is absolutely not of that colour?" "Exactly! You have to see the invisible part of the picture to understand why it can only be that colour, my friend. But to make it easier, why not switch on your special HUD device to make it visible to you..."
The outer ring colours are "paler" for visual effect only. The whole puzzle is based on 7 distinct colours and the solution is one of those 7. 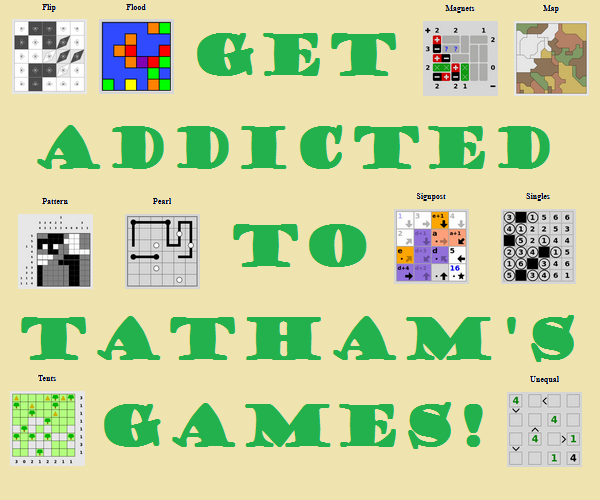 The puzzle has a single, objective and logical solution. The "Pattern" tag for this puzzle is appropriate. Basically the whole images follows a specific rule, and the central circle has to fulfil that rule as well, which defines its colour. If you take the image and superimpose the horizontal mirror image onto it, and then take the vertical mirror image of the result and combine them together, you get the image below (which I believe is what the HUD showed). You then see a distinct pattern around the star with the cyan and green/purple and blue that makes the star purple. 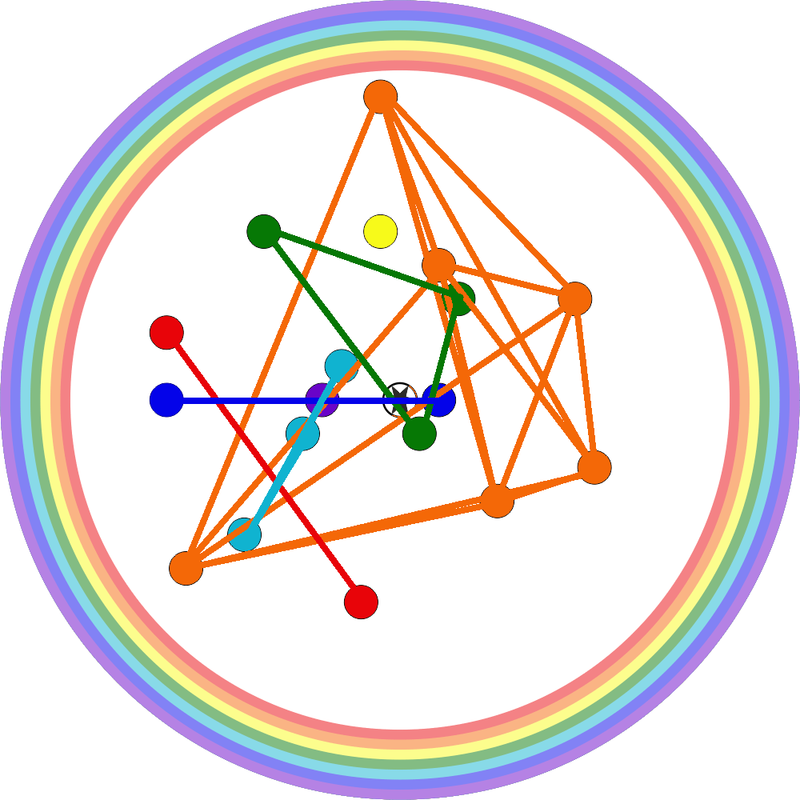 If you run lines to every combination within the same colored dots, every color is passed over except yellow. While there is only one purple dot, it is still crossed many times by many other dots. I'm going to say that the star is indigo. 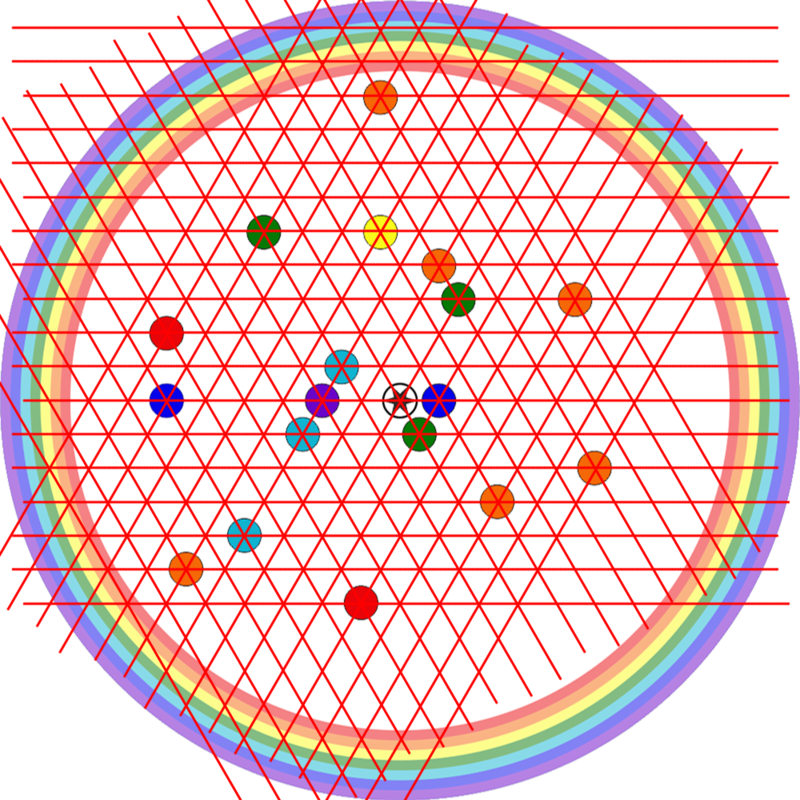 My reasoning for this is in referring to the center as the star; this is a map of the night sky. 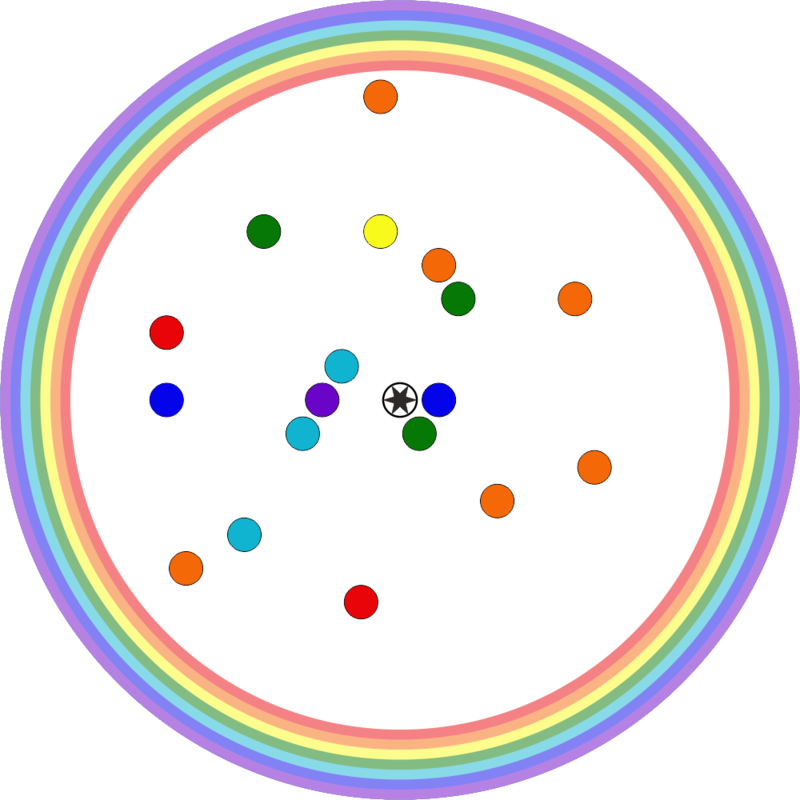 The orange circles match up to Ursa Major, and the green ones to the Summer Triangle. If you match up an image of the Triangle with the art piece above, the central star appears to be Gamma Cygni, which would mean it is indigo like the other two stars in Cygnus. with the help of @tfitzger image i came to this conclusion. so there is 3 beams passing the star major once are green and blue which gives CYAN color. RGB: rgb(43, 42, 41); HEX: #2b2a29 , which contains mainly RED color. The color of the star is purple. 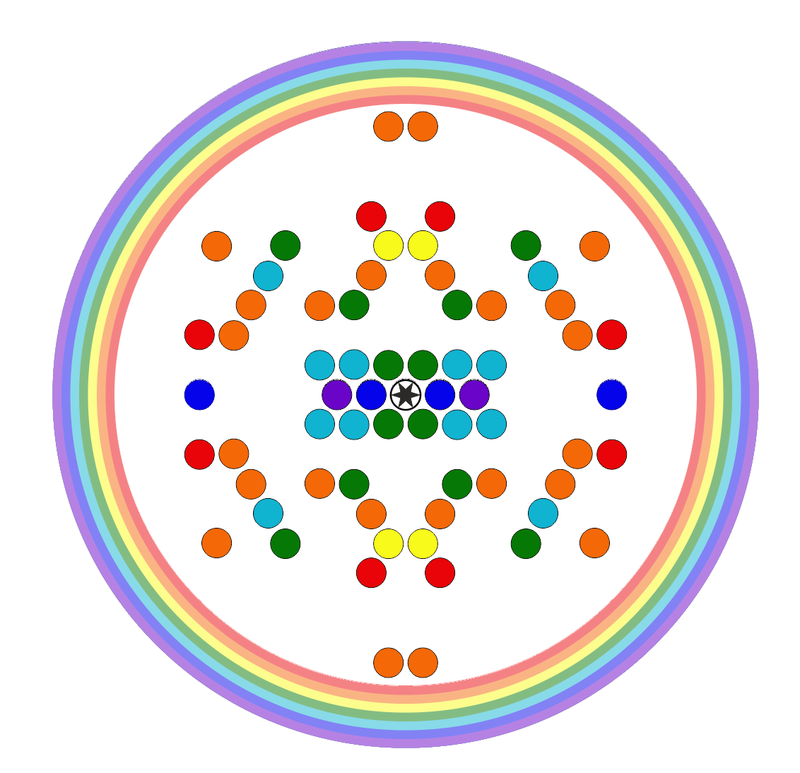 Colors are arranged according to the rule of the rainbow.